The port information does not contain data about the target or hosts you work with them, so you do not give us information about your host. It is steady and always available. We also showed how you can visualize this information and use some classification methods to learn the way your computer uses ports (spectrum & pattern). This is not a commercial application, so it does not have the fancy features of a commercial application, but as long as I tested it, it works well. The part that sends data to the server is just a simple script; which you can open it in an editor and see what information get sent to the server. All it does is what we have talked about in recent 5 post, which is using probability, Bayes Theorem, and the Bayesian Network ideas. This command sends 500 samples of your computer Internet (network) connections' port information to the server. The delay between samples is just 2 seconds. The server recognizes you by your IP address, so it is better to have a valid IP address or at least only one machine sends information in your network. (Otherwise, things get messy.) However, you can send information from one machine and look at the results on another machine if you are using same shared IP address. The server application simply collects your sending data and tries to learn your latest 5-minutes usage pattern. If your most recent usage violates the learned pattern, it warns you. The orange warnings have some low priority, but the red ones belong to some significant changes in usage pattern. So the application understands port 80, but not port 22, then port 22 and scores into 0.1024 category, port 80 also considered one in 0..1024 too. What you also need to know is that this service's design is not to tell you what application you are using. 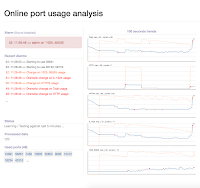 It has been designed to learn and test your computer's port usage pattern, which has a correlation with the application you use. Just do not expect it to catch immediately the changes because your computer's OS does not release or close the ports immediately after you exit a program. Close all applications which use the Internet, like browsers, messaging softwares, torrents, etc. Wait a minute or two to let your computer closes all unused connections. 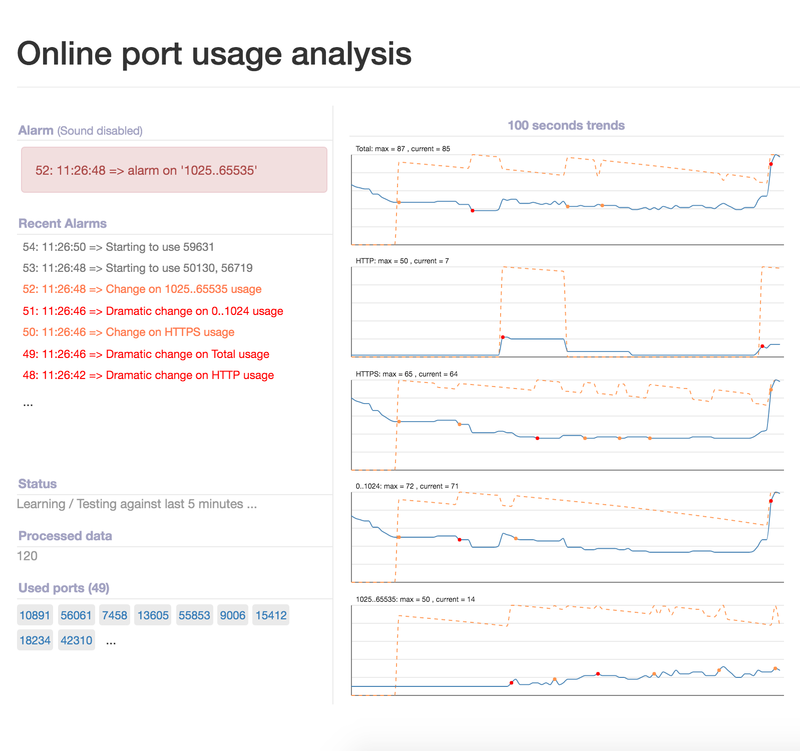 Run the given script "onlineAnalysis.sh" to send information. As I said, during the first 30 sample, it only learns the pattern, but you see it gets data. Then it starts to compare the new given dataset to the stored pattern. It keeps the latest 5 minutes information which means 5 x 60 / 2 = 150 samples to build the matrix we talked about in the previous post. Now start using search with Google. Since Google works with HTTPS protocol, it catches the changes. If you use a torrent application to download, since it opens many connections to download files, again it catches the change. The positive point is, if you use torrent for a while, it learns your usage pattern, then if you stop using the torrent, it warns you. Or if you add a new file to download it understands. Play with the application you'll find how it works. Contact me if you find anything wrong or if you have any question or suggestion regarding this application.